Enterprise organizations were taken by surprise with the recent release of Firefox 5.0 just three months after 4.0, citing security concern and lack of stable Firefox versions for enterprises to work with. At the same time Microsoft has reaffirmed its commitment to enterprises as well as general web consumers. Companies simply can’t turn around major browser updates in six weeks (and each one of these is a major update). With security releases, there was a reasonable expectation that web applications wouldn’t break as a result of changes. With these releases, there is no such expectation. So a full test cycle needs to be run with every release. By the time this cycle is completed and the browser is piloted and deployed, another version of Firefox would already be released so they’d already be behind. And in the mean time, all of their browsers will be insecure, because all security updates are rolled into the major versions. For corporate deployments, there has to be a stable branch. The resentment among enterprises can be further seen in the two opinions that Kaply highlights. Mike, you do realize that we get about 2 million Firefox downloads per day from regular user types, right? Your “big numbers” here are really just a drop in the bucket, fractions of fractions of a percent of our user base. Enterprise has never been (and I’ll argue, shouldn’t be) a focus of ours. Until we run out of people who don’t have sysadmins and enterprise deployment teams looking out for them, I can’t imagine why we’d focus at all on the kinds of environments you care so much about. A key challenge for enterprises is that they need to certify their websites, apps and add-ons each time Firefox is updated. This can take weeks or months. Security is also paramount, enterprises need access to a version that includes all known security fixes. We are exploring solutions that balance these needs, with active discussion in our community. Open Source software is well-suited to these challenges, as interested parties can come together to build what is needed. Dean goes on to stress upon Microsoft commitment to support IE versions for as much as 10 years. Microsoft’s support life cycle for Internet Explorer extends till the end of the life of the OS it was shipped with. This means, one would see support for Internet Explorer 9 to be available as far as 2020.There is a perception among the enterprise developers that the stability provided by this support would help enterprises save a lot effort on retesting their application on new browser versions. Microsoft's commitment to support its browser versions for as much as ten years allows corporate customers to settle on a version and ignore everything newer—but this comes at the expense of the public Web. This happens directly—Internet Explorer 9 just isn't as fully featured as Firefox 5 or Chrome 12, so even the latest version of Microsoft's browser is behind the times—and indirectly—because these legacy browsers contaminate and retard the public Web. Beyond that, they're also, arguably, bad for the companies themselves. A company that today needs an Internet Explorer 6-dependent application is in a tough spot. Internet Explorer 6 isn't available on current operating systems, and with each passing day, developer knowledge of such an application will decrease. That IE 6 dependence has to be broken some day, and the longer these companies wait, the harder, more expensive, and more disruptive that change will be. This battle is not limited to IE vs. Firefox; Google Chrome has made serious impact in this space. Interestingly, the rapid 6 week release approach was adapted by Google last year for Chrome. 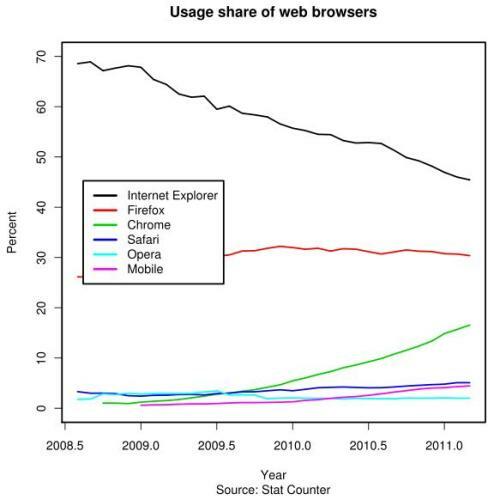 Chrome’s market share in web browser space has been growing steadily and now stands third behind IE and Firefox. Now, with Mozilla also going in with a similar strategy we have two different strategies being employed in the web browser space. It would be interesting to see which would be able to make the most impact. It's not surprised to me ! I have been working for many BPM project whose target browser is IE6 and it's just because the BPM Provider use some vbscript in the client side code and we can't run any other browser !!! I don't think Firefox will take back the users who have moved to Chrome. Even if Mozilla delivers faster new releases, Google is still behind Chrome and this browser will remain enough attractive for most of it's users. So, in order to attract new users, that is, to bring more users towards lastest web standards, Mozilla has to attract IE users. And quite a way to do so is to listen better enterprise needs IMHO.